To chart a future for Canal Park, one of Duluth’s most beloved and unique areas. Imagine Canal Park is a year-long community engagement initiative that invites Duluth residents and visitors to think critically and creatively about how Canal Park should look, feel, and function. Led by the City of Duluth, along with 8 80 Cities and Zeitgeist, the project is a recipient of a Knight Cities Challenge grant, awarded by the John S. and James L. Knight Foundation. It is also generously supported by the Duluth Superior Area Community Foundation. In the first phase of the project in fall 2017, we initiated a comprehensive community engagement process to learn what residents, visitors, business owners, and other stakeholders think about Canal Park, and what ideas they have for improving the area. Over 1,200 people shared thoughts, concerns, criticisms, and praise for Canal Park through online surveys, at public events, and at community workshops. From February to September 2018, we tested those ideas in real time and launched meaningful experiments, or pilot projects, to better understand the benefits and trade-offs of new designs, traffic patterns, and events. 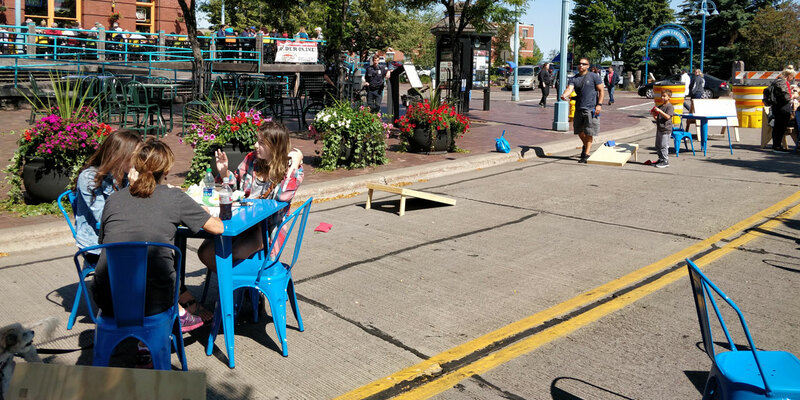 Pilot projects included a month-long celebration of winter, the transformation of streets and parking lots into parks and plazas, new wayfinding signage, re-designing a street configuration, and more. Not every experiment yielded positive results, but in trying new things we all learned what works and should be kept, and what brought adverse impacts and should scrapped. Through these pilot projects we collected valuable data and feedback from diverse stakeholders which will help guide future decisions and investments in the area.